Eric Cline is Professor of Classics at the George Washington University, Director of the GWU Capitol Archaeological Institute, and former Chair of the Department of Classical and Near Eastern Languages and Civilizations Department at GWU. 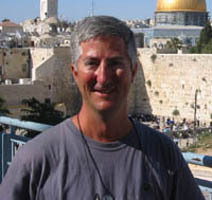 A National Geographic Explorer and Fulbright Scholar, with degrees from Dartmouth, Yale, and the University of Pennsylvania, he is an active field archaeologist with 30 seasons of excavation and survey experience in Israel, Egypt, Jordan, Cyprus, Greece, Crete, and the United States, including ten seasons at the site of Megiddo (biblical Armageddon) in Israel and eight seasons at Tel Kabri, also in Israel, where he is currently Co-Director. Winner of the 2014 "Best Popular Book" award from the American Schools of Oriental Research for his recent book, 1177 BC: The Year Civilization Collapsed, a three-time winner of the Biblical Archaeology Society's "Best Popular Book on Archaeology" Award (2001, 2009, and 2011), and a popular lecturer who has frequently appeared on television documentaries, he has also won national and local awards for both his research and his teaching. Dr. Cline is also one of the 36 inaugural NEH Public Scholars announced in July 2015; the Public Scholars program is a major new initiative designed to promote the publication of scholarly nonfiction books for general audiences, and Professor Cline was chosen for his upcoming work on "Digging up Armageddon: The Story of Biblical Megiddo from Canaanites to Christians". Dr. Cline is an AIA Norton Lecturer for 2018/2019.